The controller has two new buttons. The first allows saving and sharing the experience out to YouTube. The second is Google Assistant, using the integrated microphone in the controller. 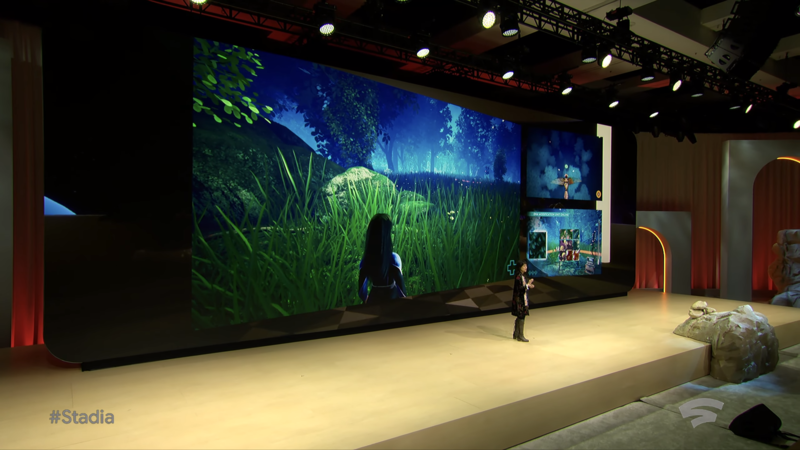 This allows game developers to integrate Google Assistant into their games. 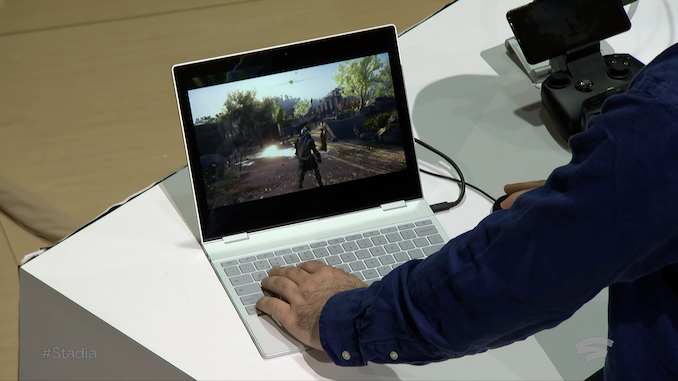 It also allows users to ask Google when they need help in a game - and the assistant will look for a guide to help. 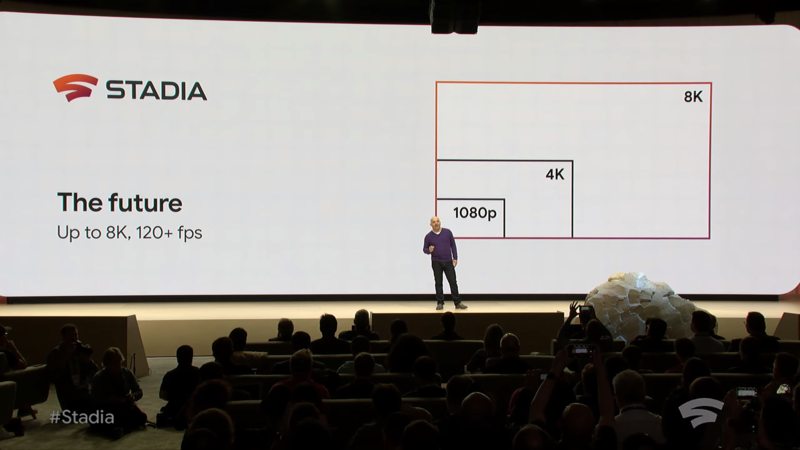 Sadia is powered by a custom AMD GPU with 10 TFLOPS of power, with a custom CPU with AVX2 support. Combined they create a single instance per person. 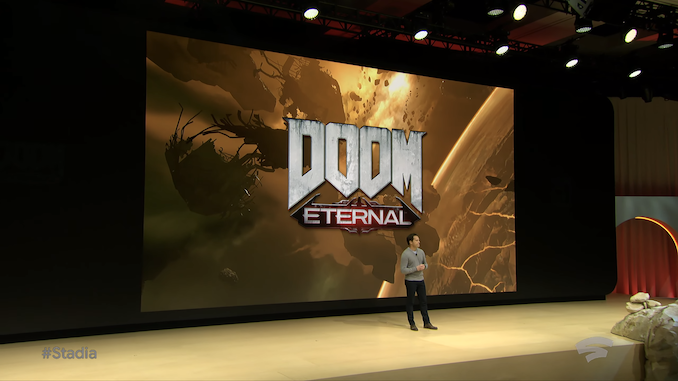 Uses Linux and Vulkan, with full Unreal and Unity support. Havok engine support as well. Tool companies are onboard. At a high level, the specifications for the GPU are almost a shoe-in for AMD's Radeon Vega 56, right down to the number of CUs and compute throughput. So while not confirmed, it's very likely that Google is using some kind of Vega 10 card; probably a variant of the Radeon Instinct MI25. 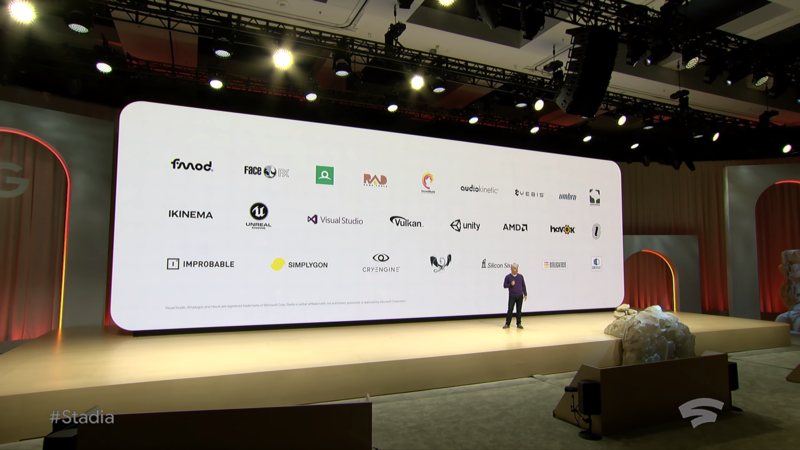 However it's notable (and unusual) that Google is only announcing their partner for the GPU and not the CPU. With AMD capable of delivering solid products in both categories, one would consider them a shoe-in for the CPU as well since they're already providing the GPU. 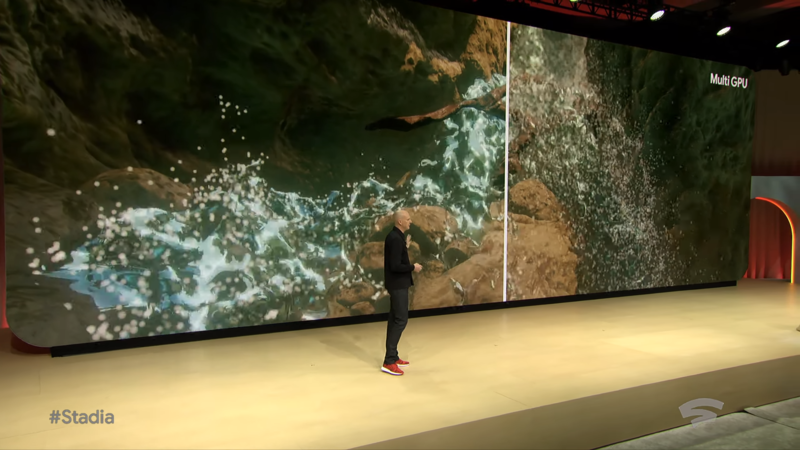 However Google's announcement took special care not to announce the CPU partner, and even AMD emailed us that they could only confirm the use of AMD GPUs. So whether Google's CPU vendor is Intel or AMD remains to be seen. 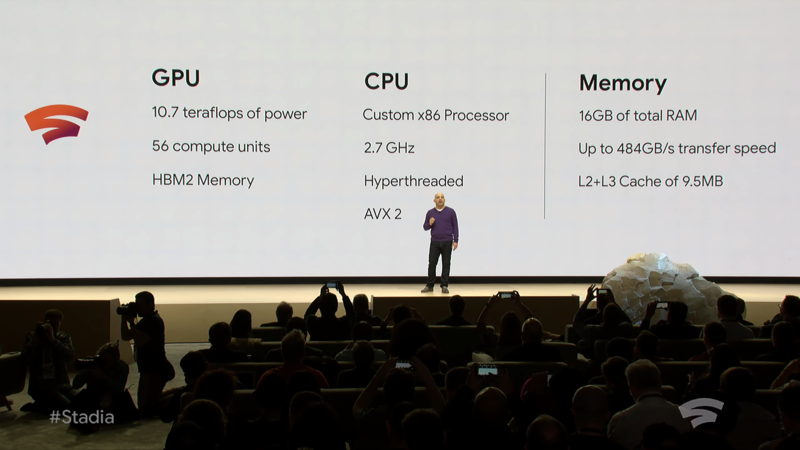 There are good arguments for each based on the vague specifications, though with AVX 2 support listed, if it is AMD then that would mean that Google has gotten their hands on some early Zen 2 CPUs. 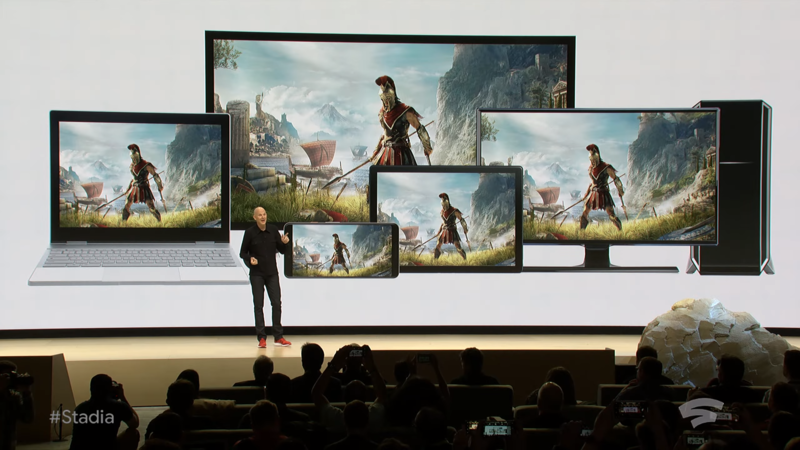 Built on Google’s platform, Stadia will also support machine learning. 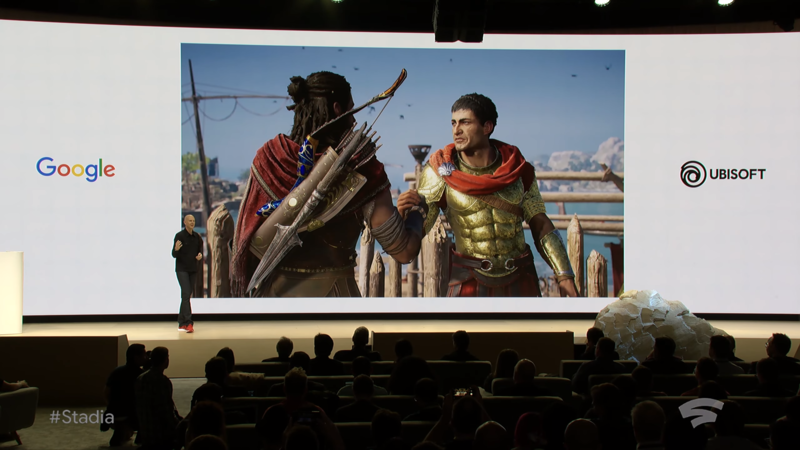 For developers that want to take advantage, they can incorporate Google and third-party libraries to help improve games over time and enhance the experience both on a per-user level and on a local/global scale. 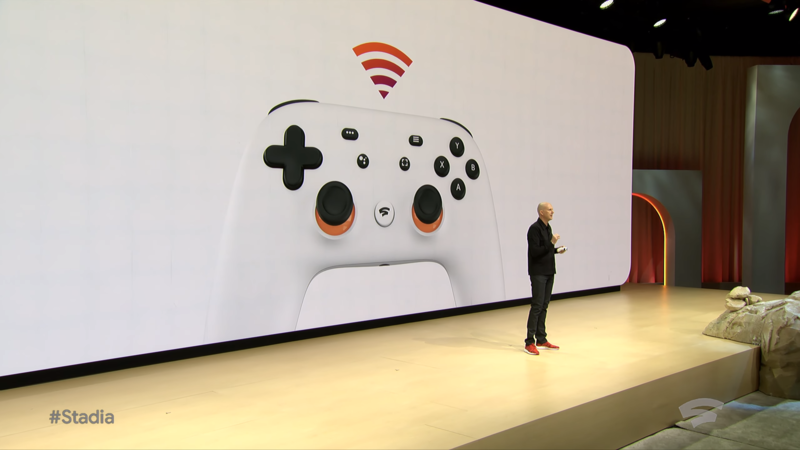 The other focus on Stadia is the interaction with YouTube. 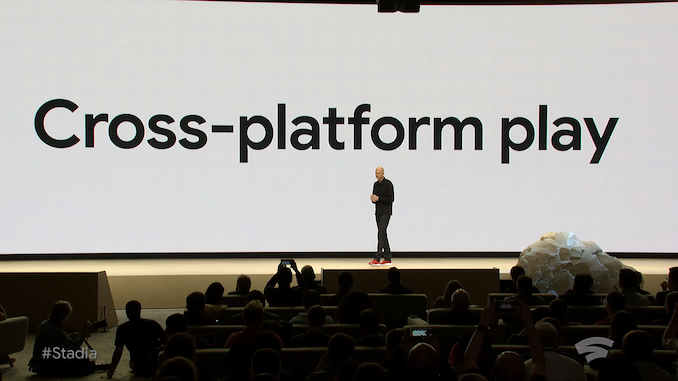 Google points out that gaming has been a fundamental part of YouTube since its exception, and it is Google’s goal to help creators interact with (and monetize) their audience. The idea is that creators can directly livestream from Stadia, as well as play with creators through Stadia. ‘Crowd Play’ will allow users to play directly into the server instance with the creator – it acts like a lobby, so players will sit in line to play with their favorite creator. 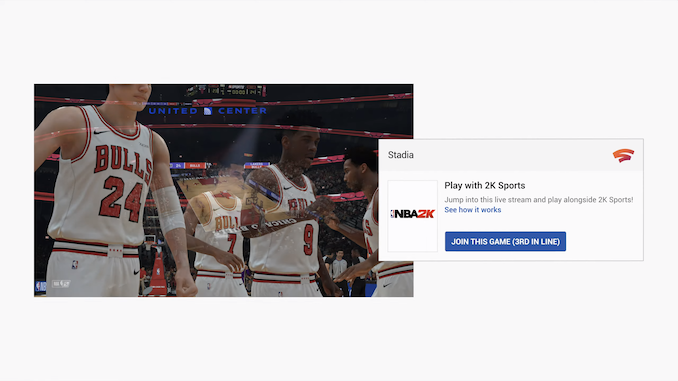 For example, the NBA2K above shows 'join this game (3rd in line)'. Google states that any link from any location can act as a launch point for a title. 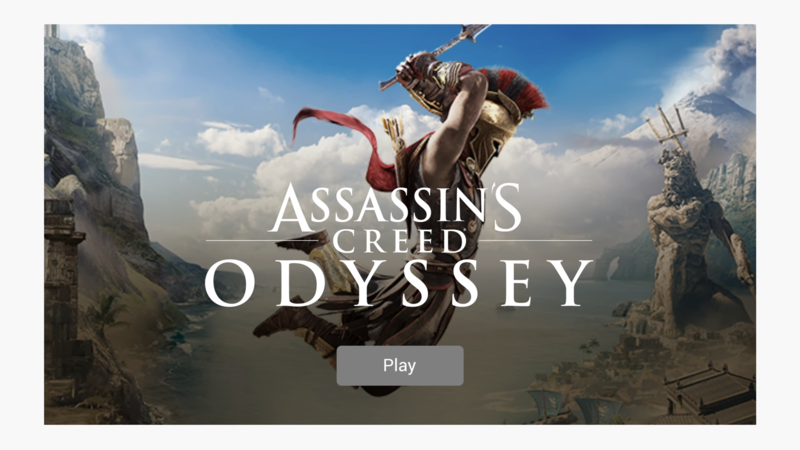 This means that developers do not have to be limited to a single game store – games can be launched from almost anywhere, as long as the user is in an up to date Chrome browser. Google is also set to put extensive parental controls into the mix. Google will be creating an entity called ‘Stadia Games and Entertainment’, headed up by Jade Raymond, enabling first party studios to use Stadia. Other partner studios will also work through the new division as outreach in order to enable game development on Stadia. Developers who want to create for Stadia should go to stadia.dev to sign up for tools and resources. 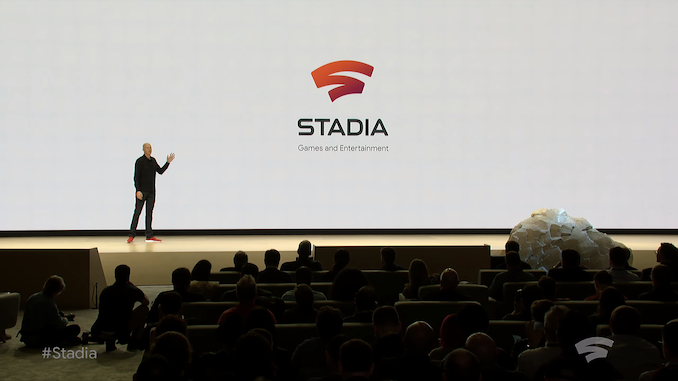 Stadia Partners for distributers. 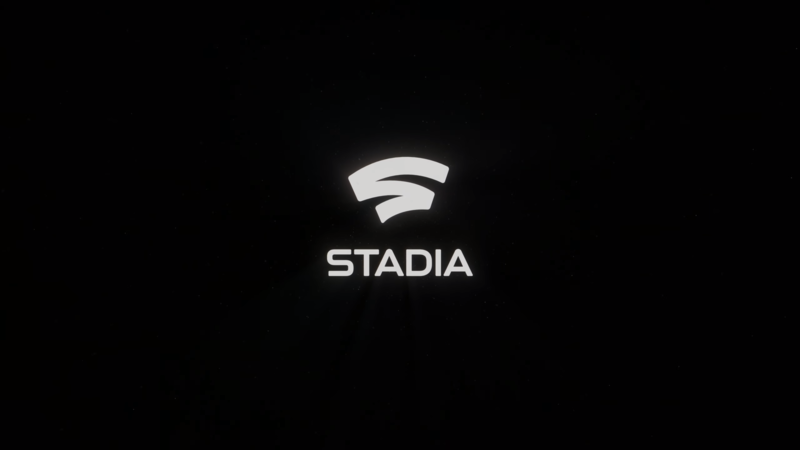 Stadia.com will be the hub for gamers. Stadia will launch in 2019, in the US, Canada, UK, and most of Europe. No word on pricing yet, but Google will be announcing more in the Summer. There is a blurry line between having local nodes everywhere and Microsoft's Xbox rental program, IMO. That's basically what it takes to get latency down. That being said, if one never experienced low latency gaming, then they would never know what they are missing out on. Same with gsync/freesync, high refresh rates, etc. Even then, some people will not notice a difference. A majority of the world has low bandwidth, even in "first world" countries like the U.S. Then as said, latency, also jitter. If I was playing on WiFi, there will still be a chance of packet loss, especially in e.g. cities with high density, think apartment blocks next to other apartment blocks. This "game service" will only be properly usable by a few, and only if you're used to it already, else most will rather have a PC/play on the device. Streaming is often less than ideal even on the same layer 2 network. I live in the boonies, started a computer service, built a wireless ISP from nothing, the towers, the hardware, everything. I've got tons of bandwidth in my home (do a lot of video editing as a hobby on my laptop) so I've got a little experience with networking. Gran Turismo and Street Fighter are very sensitive to latency, particularly latency changes. I can stream from one desktop to the other using Steam, stream to my laptop over 802.11ac (700+ air rates, 450Mbps confirmed in testing), stream from my PS4 over ethernet or wireless. The latency is fine on most games, but certain ones are borderline unplayable. It is incredibly difficult to recover from a slide or the beginnings of a spinout when you only get the feedback and visual cues 5-10ms later. Big explosions make the bitrate increase, which is fine, but often it doesn't increase quickly enough so it is pixelated badly and that sudden increase in bandwidth affects your latency as well. We're talking about input latency of 1ms and video latency of under 6ms with hardware h264 encoding built into my GTX 970s. The PS4 has hardware encoding as well, but there is still a delay. 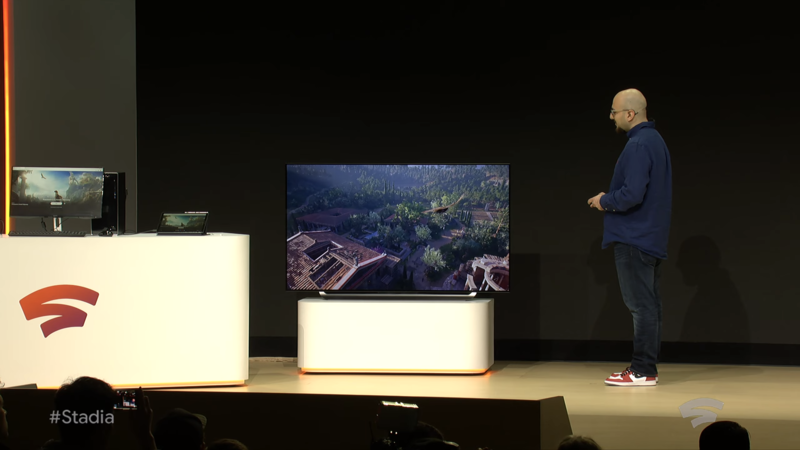 Don't get me wrong, I love the streaming aspects of these systems, but it isn't a replacement for a console. Stuff like Modern Warfare, Skyrim, Fallout, those all work great. 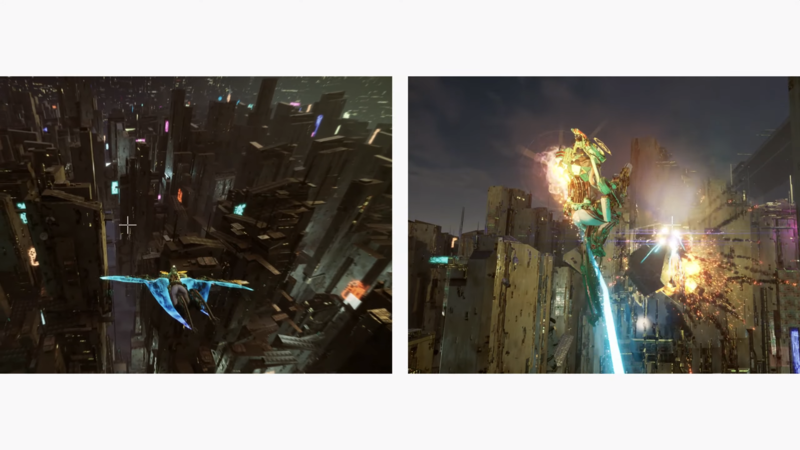 Matter of fact the compression tends to work out a lot of aliasing issues, so often you can stream a 1440p or 4k image to a 720p client and have a truly beautiful image when playing, but it just isn't quick enough for certain games. It has made a few of my old Core 2 Duo systems useful again though. I remember being pretty psyched when OnLive was first announced in 2009, and then actually seeing it in action sometime around 2010/2011. It was horrible! Lots of artifacts, constant shifting to lower bitrate streams, pretty bad latency, frequent long pauses. Game streaming has improved somewhat over the years (I tried out GeForce Now recently), but it's still nowhere near that initial promise. You switch from GeForce Now over to a locally rendered game and it's a night and day upgrade.